As part of its 160th anniversary celebrations, the Hotel Vier Jahreszeiten Kempinski Munich has launched a luxurious cigar lounge. Colin Finnegan, owner and founder of the Amsterdam-based studio FG stijl has created a magical venue of royal Bavarian flair with a modern twist, offering the latest in technological amenities. The new Kempinski Cigar Lounge by Zechbauer is Munich’s most exclusive lounge for cigar, cigarillo and pipe enthusiasts who stay at the hotel or who visit the Zechbauer Cigar store. Day or night, guests can enjoy the world’s best cigars courtesy of Max Zechbauer, Germany’s most established supplier of fine cigars and appointed purveyor to the royal Bavarian court. Now in its seventh generation, the company has opened a cigar shop at the Vier Jahreszeiten with direct access to the lounge. The custom-designed lounge tables include hand-made inlays of tobacco leaves under a layer of varnish, with hand-carved, gold-coated table legs. 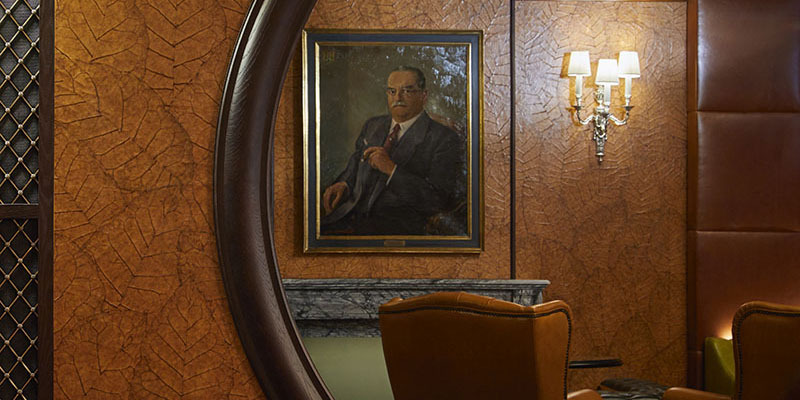 The themed artwork and delicate tobacco-leaf wall panels pay homage to the tradition and culture of cigar smoking. Interior designer Marc Hüffer selected sophisticated, natural materials for the lounge shop such as leather, bog oak and copper – materials that evoke a unique flair. All of the lighting is also custom-made – featuring mouth-blown glass lamps designed exclusively by the Czech company Czevitrum.